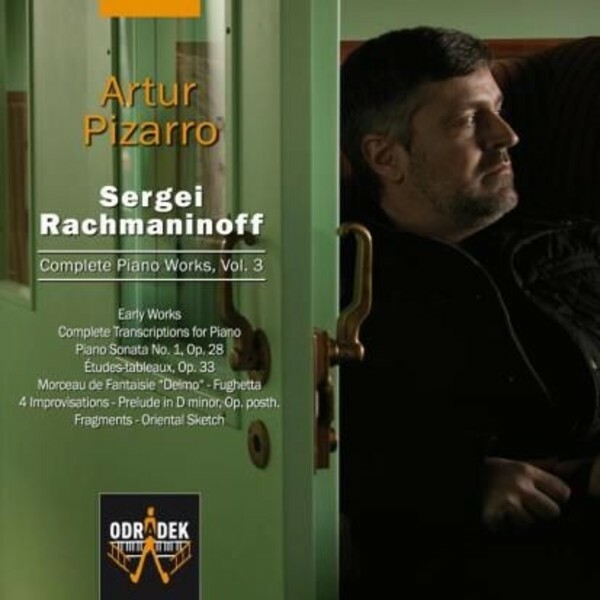 Distinguished Portuguese pianist Artur Pizarro concludes his landmark recording of the ‘Complete Piano Works’ of Sergei Rachmaninov for Odradek Records with its third volume. Among the compositions on this 3-CD set are the early Suite in D minor, only recently re-discovered and given its premiere (it is thought) in 2007, the Piano Sonata No.1, the Etudes-tableaux, op.33, Rachmaninov’s transcriptions of other composers - from Mendelssohn and Bizet to Rimsky-Korsakov’s ‘The Flight of the Bumble Bee’ - and a host of miniature pieces. Artur Pizarro is renowned for his performances of Rachmaninov. A former winner of the Leeds Piano Competition (he played the Third Concerto when he won the competition in 1990), Pizarro offers his listeners a lifetime of love for, and experience with, this music which speaks, as he says, “of the endless variety of the human condition”.